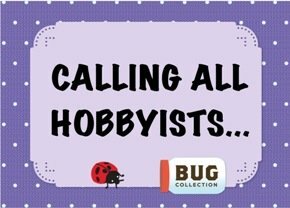 Do you have a hobby you love? Would you like to share your hobby with others? Are you available on Saturday January 17, from 2-4 pm? If so, you might like to participate as a presenter in our Happenin’ Hobby Open House at Central Library, in celebration of National Hobby Month. You won’t have to give a speech, but you will have to answer questions from interested people and be ready to show off some of the great things about your hobby. Bring some examples. Bring some of the equipment or supplies. Most of all, bring your own enthusiastic self! If your family and friends are tired of hearing you go on and on about your favourite pastime, here’s your opportunity to gain a whole new audience! We are looking for photographers, artists in all media, coin collectors, jewellery makers, those who love sports (or sports card collecting), genealogy buffs, knitters, crafters, woodworkers, robotics enthusiasts, writers, birders and more! If you can help us out we want to hear from you. Please call 519-255-6770 x4552 and leave a message with your name, your phone number and your hobby. Or you can email us at askalibrarian@windsorpubliclibrary.com . We have a tight deadline, so we need to hear from you on or before November 13, 2014.